Bermuda Shorts. A rich, vibrant, creamy neon purple. Mini Shorts. Bright, glowing orange. Short Shorts. Hot neon pink. Shorty Pants. Smooth bright yellow creme. Aren't the beautiful? They can be even more beautiful. Heartbreaker is the wonder polish. It can make anything look better. It's a must have! It adds a gorgeous depth to any color I've tried it over. Bermuda Shorts with Pure Ice Heartbreaker. It adds an amazing deep blue and green shimmer. Mini Shorts with Pure Ice Heartbreaker. Again, adds amazing blue/green shimmer, but against the orange it seems to have a lot of gold. Short Shorts with Pure Ice Heartbreaker. This looks iridescent in real life. The blue and green shimmer accents the hot pink perfectly. Shorty Pants with Pure Ice Heartbreaker. 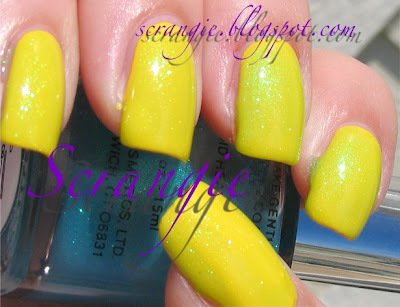 Against yellow, it not only adds that beautiful sparkle, but it makes the polish look green from some angles! I'm really impressed with Essie's Neon collection. 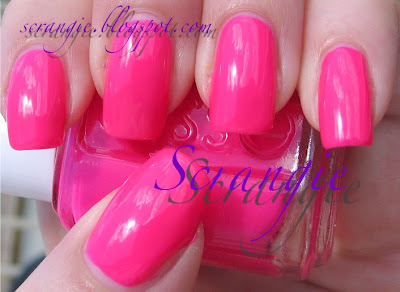 The formulas are great, sure, but what has me the most shocked is that Essie released NEONS! I knew they could do it! Hey Obby! I definitely love RPGs :D Thanks for your comment! Oh, they all look great! I can say it again; GOD JOB ESSIE! Ooh. After seeing all the pictures for the new collection, I was so sure I wasn't going to buy any of these. And now, after seeing your pictures I realize that I actually _need_ both Bermuda Shorts and Shorty Pants. Pretteeeee.. hopefully I get mine next week. I'm glad to hear they are glossy and if one coat would be enuff.. wow. Chaosophia, thank you! Bermuda Shorts is definitely my favorite, but I love them all! Yay, I need help finding it for sure! I looks sooo awesome! Sanna, email me at scrangie (at) gmail (dot com)... I *might* be able to help! 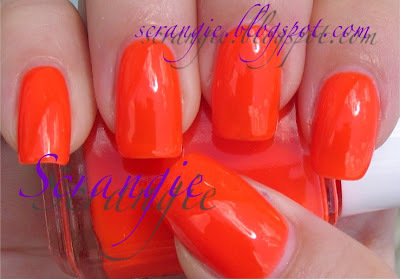 I LOVE your site, found it whilst looking for 'proper' photos of the China Glaze Ink collection. I'm in England so I have to rely on eBay to feed my OPI/CG habit, and your swatches are already proving VERY helpful in checking out colours before I buy them - keep up the great work!